“What you’re saying matters less than who you are,” he continues. Persuasion is an over-rated skill and an under-rated discipline. Connecting with others and seeking to bring about change to get them closer to what they seek is the key to effective persuasion, the kind that creates long-term, even permanent bonds. The story matters, don’t get me wrong. The teller of the story, and their genuine-ness, matters more. Today, an abbreviated Diff, on the theme of basketball, as we pivot to focus on The Middle and his team, seeded #1 in the State Basketball Tournament and playing an arch-rival in round one. And, it fits the “balance” theme for the week. Offense and defense, if not simultaneously, certainly instantaneously. Balance, the ability to change directions, to pivot. And, in basketball, as in business, those who pivot best, win most often. Thanks, RKD, and go, Warriors! Control is an illusion. Balance is the holy grail. Multiple generations in our society have been taught that control is our end-game. If we’ll just commit the hours, the intensity, the practice time, the mind-numbing debates about contingencies and “Plan B’s” — we’ll control the outcome. Um, no. We won’t. At best, we might impact the outcome, but control it? Not so much. We talk about cpntrol in sports, in business, in relationships. It seeps its way into virtually every aspect of our lives. And it’s an illusion, because we control two things. What we believe, and how we respond, or what we do next. Balance, on the other hand, is how we navigate the reality of a frustrating lack of control. Sometimes the slacker across the row gets the promotion. Sometimes the market crashes right after we made that “sure-thing” investment, the one we researched for months. Sometimes people who are doing a great job lose that job. Sometimes we make almost all of our shots and still lose the game. Preparation, planning, execution can all be spot-on, and the outcome might not be what we expect. The market might change (remember Blockbuster?). The buyer might lose their senses, or perhaps more likely, lose their funding. The perfect night out might be disrupted by a thunderstorm or a back-up on the highway. Geese might fly in to the engines and we might end up in the Hudson River instead of Charlotte / Douglas International Airport. We don’t control any of that. Balance, though, is what keeps us from getting too high when things are clicking and from getting too low when all hell breaks loose. Balance reminds us that if She And The Three are safe tonight, the important stuff is covered. We want control. We want it really badly, and we’ve been trained, for generations, to pursue it. To chase after it. To sacrifice for it. Who we align ourselves with matters. Who we “hang with” matters. If we believe one thing, deeply, yet align ourselves with a cast of characters who don’t live out those beliefs, it becomes difficult to be taken seriously. More important, it becomes difficult to take ourselves at our word. Good character is important. Really important, as a matter of fact. It’s also virtually impossible to maintain if we’re in bad company. Or, at the very least, it becomes exhausting. If something feels “off,” a good place to do the first gut-check is to look at whom we’ve aligned ourselves with, and determine if that alignment is part of the problem, or part of the solution. The competition’s job is to knock us off our game. Get us to price differently. Alter terms. Somehow, someway to do something that either weakens our position in this deal, or in the next one, when they can talk about what we did in this one. It’s one thing to be consistent. It’s another thing completely to have our identity be born of a “point of view we care deeply about.” Earlier in my career, I worked for a company that wouldn’t, under any circumstances, negotiate price. In one of our biggest deals ever, the prospect pushed back pretty hard. The ideal, the point-of-view that he had might have been fairness, although I doubt it, because life isn’t fair, and nowhere is it written that we should expect it to be fair. I believe it was integrity for my mentor. He never wanted to explain the unexplainable. To justify the unjustifiable. He knew the value of what we offered. He priced it to reflect that value. And he never had to worry about one client comparing notes with another. Today, we’ll probably have more than one opportunity, perhaps not foundational or principle-based, but more than one opportunity to define ourselves in our markets. What is it we care about deeply enough to have it guide us? The first six words are some heady stuff, especially considering they were coined over 2000 years ago. They still hold true, too. Strategy is really about perspective. The big picture. The long view, to paraphrase General Tzu. It’s not that we should overlook the close things, or the tactics, we simply need to see them in the context of what we’re trying to accomplish in the grander scheme. What are your instincts and perceptions telling you? Listen closely, keeping an eye out on the horizon to make sure our thoughts and actions in the here-and-now are in synch with our long-term strategy. Fair questions. When we learn, let’s keep in perspective why we’re seeking, and then what we’re seeking comes in to clearer focus / context. It’s not one at the expense of the other. It’s making sure the harmonies align so the music sounds good at the end. Passive is no way to go through life. And, passive isn’t the opposite of aggressive. We can either engage, or we can coast — and I read Ms. Oliver’s intent here as wanting us to engage. Yesterday, we touched on rules — having as few as possible, and trusting people to make a difference. But how? Change The Conversation. Re-hashing the same old crap doesn’t move the needle. Constantly seeking a fresh, or at least a different angle, raises the likelihood that we’ll be ahead of the curve, or at least ready for it when we it comes along. Changing the conversation makes everyone in the conversation — and everyone affected by it — better; better prepared, better informed and better suited for what comes next. We might really wish it was yesterday, six months ago or 20 years ago. Too bad, because it ain’t. And the conversation from yesterday is less relevant today and loses relevance with each passing minute. Commit to Being (and Actually Become) A Learning Organization. Learning constantly means we never get old and our businesses never get obsolete. Get deep with the team. Gather data. Analyze the crap out of it (not at the expense of deciding and acting, though!). Dig for the “Why?” Learn every day. Learn as leaders. Learn as members of the team. Learn as a team. Constantly. Without ceasing! Honor Outcomes Over Processes (and Over Transactions). You might be thinking, “Wait a second, Heston! A transaction is an outcome.” Technically, that’s true. But unless we’re going to base our success on one day, one deal, one contract, one client — each transaction becomes part of something bigger. You might be thinking, “Wait a second, Heston! Without process, we’ll just be running willy nilly all over the place!” I’m not suggesting that process is bad, unless and until it becomes the problem. Processes don’t solve problems. People solve problems by deciding and acting and honoring outcomes. That’s how we improve our performance and our processes! It requires planning, execution, evaluation, course-correction and keeping our eyes and our actions focused on the greater prize. When difference makers think “outcome,” they’re thinking of leaving permanent evidence that they did more than simply visit this world. We’ve all seen companies that ignore these four cornerstones. I wonder if we’ll remember them when they’re gone? I hate rules. As near as I can figure there are ten that really matter, and they got carried down off a mountain a few thousand years ago. And, for clarity, the quote above is not an absolute, one-size-fits-all belief, it’s a general commentary on business. Man, is that beautifully simplistic! Build systems, procedures and policies that honor the kind of people we should be hiring and developing in the first place! Fewer rules, more trust. Fewer sticks, more carrots. As for rules, the aforementioned ten stand as noted. In the workplace, I’ve settled on The Heston Five. Be reliable. Show up on time, ready to work, every day. Be positive. On our worst day, there are 10,000,000 people who’d trade places with us for every one that wouldn’t. Be honest. There is no mistake so big it can’t be addressed, yet there is no lie so small that it can be forgiven. The point remains. Designing our operations based on trusting the people we hire and spend each day with makes for a happier life and a better client / customer experience, employee retention and a workaday life that is energizing and profitably productive. Thanks for the gracious latitude you gave me to navigate the loss of a buddy… Thank you also for your warm responses, across the four platforms on which The Daily Difference is disseminated. Dad did something that ticked my mom off in 1953. None of us know what it was. She was pretty hot about it until the late 1970’s, and finally pretty much over it by the time he died in 2002 and hopefully completely over it when she passed four years later. I made a few bad mistakes along the way, most notably in 1983, 2014 (maybe several in that year….just sayin’…) and 2017. A few people did me wrong, in a couple cases, really wrong along the way. We all have those things. And our biggest win is not only not carrying them forward, it’s not ever picking them up. Nope, none of it matters. For sure it doesn’t matter anymore, and maybe it never did. Of course we want to learn from experiences, but once they’ve happened there’s nothing we can do to keep them from happening. Thus, what we do next, that’s what matters. Pooh gets it. If we’re in the here and now, here and now, we’ll get “there.” It may not be where we thought we were going, and the river may not flow as straight or as quickly as we’d like, or sometimes it may get a little too white-watery for our liking. We may have to get up and we may have to portage the canoe through shallow waters or around dangerous rapids. But we shall get there someday. And if today is that day, none of that stuff in the rearview mirror will matter. If today is that day, we owe it to ourselves to have our eyes fixed on wherever our there is. And today, our there is here. 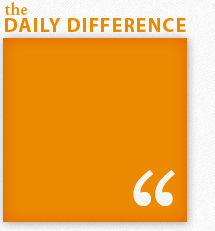 Enter your email address to receive The Daily Difference in your inbox. Making a Difference may require changing the conversation. These Difference Makers may hold the key to the change you’re seeking.